Round to square in shape with the bottom slightly bigger than the top. 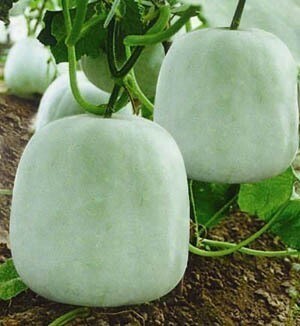 When mature the gourd is coverered in white powder. Single fruit weights 3 to5 Lbs. Palmate leaf, short internode wth the first female generally appearing in 6th-9th section, each 2-4 leaves will bear a female flower, sub-vines can also bear fruits. Cultivation: The growing period is about 90-120 days, seedling age is about 35-40 days, from transplanting to beginning of harvest tender melons need about 40-55 days. Best started indoors 6-8 before transplanting outdoors.